When Eric and I originally planned out the 2017 season, we planned to not fully taper for 70.3 Florida and treat it like a “B” race. I still feel I am inexperienced at the 70.3 distance as I’ve only had one race where I feel like I put it all together out of my 3 other attempts. Once you step up to long course racing, there will always be something that doesn’t go your way during the race. And if I’m going to have a solid result at 70.3 Worlds and IMFL later this year, I need more experience at the distance to learn how to adapt when things go wrong or not in my favor. So Florida presented a good early season opportunity to test my fitness and see where we are before the wedding later on in April. What Eric and I didn’t plan on was stringing together the best and most consistent 5 months of training I’ve ever done. I laugh when I say this but its true; we somehow fell into extremely good fitness on accident. Eric kept throwing workouts at me and I kept knocking them out of the park. Eric had mentioned that he was waiting for me to fail on a bunch of workouts but I never did. The EMJ camp fit in perfectly (also unplanned) as it gave me a big boost in training load and I feel I came away with way more fitness than I had going into it. As you can see below, my CTL (shaded blue area) peaked around 115 for 70.3 Miami and 126 for 70.3 Florida. Needless to say, we were much better prepared for this race compared to my race in Miami. 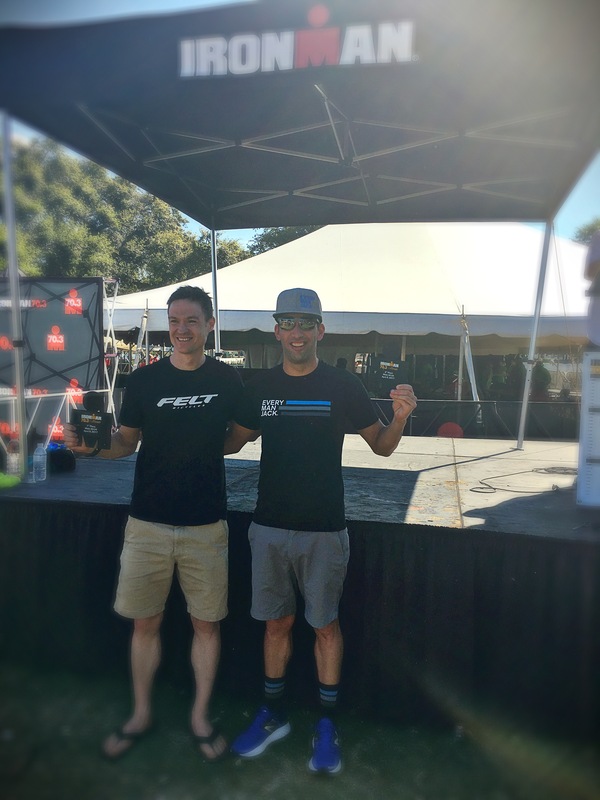 A few weeks before the race, Eric and I talked and decided not to “waste” my fitness. I was in really good form and with the wedding/honeymoon coming up 2 weeks after, we wanted to capitalize on the fitness I had and see what I could put together with a full taper. I woke up early Saturday morning and did a short run with some drills to wake the body up and get the legs moving. Mandy and I then hopped in the car and made the trek up north to Haines City. I got in a quick bike ride to see the run course and the first part of the bike course to get the lay of the land. I then got into my new Roka Maverick X wetsuit and got in a quick swim in the lake. I have always hated swimming in a wetsuit, not only because I’m a strong swimmer, but mainly because my shoulder always feel restricted and they start hurting within the first 300-400 yards. Well let’s just say the Maverick X (and any Roka wetsuit for that matter) takes that into consideration with their wetsuit design. The wetsuit was designed with the “arms up”… you know the actual body position you are in when you are swimming. So when you put your arms above your shoulders, you can really feel the wetsuit open up and give your shoulders that freedom of movement and flexibility compared to when you are normally walking around in a wetsuit with your arms down. Big props to Roka…. be sure to check them out if you haven’t already. I had a hard time falling asleep Saturday night and around 10:15 pm, the fire alarm at the hotel went off. I was immediately reminded of my freshman year in college where one of the basketball players used to pull the fire alarm in our dorm at 1 am when I had morning practice a few hours later. After sitting outside for 15 minutes or so, we were let back into the hotel and tried to get some sleep. Race morning started early at 3:30 am since transition closed at 6 am and we didn’t want to be scrambling trying to find a parking spot. Mandy drove over to the race while I started eating my breakfast. Once at the race, I got my transition area setup, went for a quick jog, and then did my transition simulation to ensure I could find my transition area in the heat of the moment. I headed over to the pool and tried to stay warm until it was time to get into the wetsuit. About 30 minutes before my wave was to go off, I got in a 10-15 min warmup in the pool. I hopped out of the pool and walked over to the beach/lake and got in line with the rest of my wave. It was still rather dark with a 7:10 am wave start and with the “M” shape swim, I knew sighting would be a little more difficult than usual. The horn sounded and I got out in front without too much contact. I had one guy right next to me for the first 100-200 yards but then I noticed he quickly went dropped back and tried to sit on my feet. The swim was rather uneventful with the exception of a few spots where there was a lot of wake. I figured it was the jet ski making all the waves and it seems others noticed the same thing. I was able to navigate my way through the waves ahead of me without any real issue. I struggled to find a couple buoys with the lack of daylight so I had to stop and pause a few times to make sure I was swimming the shortest line. I exited the water first, knowing I had swam well but was a tad worried I might have swam too hard. I got out of the water, zipped down the wetsuit, and started getting into my EMJ Louis Garneau sleeved kit (I like it rolled down for the swim). I noticed my hr was skyrocketed running through transition. I tried to tell myself to relax and slowed down a bit to try to get my hr down. By the time I got to my bike, I had my kit all the way up and it just needed to be zipped up. It worked out perfect as I didn’t waste much time getting it on. Remember when I mentioned I needed to be able to adapt when things go wrong? Well as soon as I got on the bike, things went wrong. If you have ever done this race, you know how there is a very short flat section out of transition and then a short downhill that leads into an uphill section which can make flying mounts and getting into your shoes very tricky. Well I scoped out the situation the day before and had a good plan to get into at least one of my shoe’s before the uphill section. And then I could get into my second shoe after the uphill. Well that did not go to plan and I give myself a big “F” on execution. The whole situation got into my head and I was so worried about getting into my shoes; I mounted my bike and started to get into my left shoe almost immediately without much speed. Big mistake. I hope no one got video of the catastrophe that followed as it probably would go viral on youtube, facebook, and definitely slowtwitch. I hit the pavement, my chain came off my chainring (on the outside), and the chain got stuck in between my cassette and disc wheel. I looked like I had never rode a bike before. After what felt like 10 minutes, I got myself situated, I put one shoe on while off the bike, got the chain fixed, and started pedaling. At this point, I could only laugh, smile, and shake it off. I refuse to look at the data to figure out how much time I lost. Mostly because I am extremely embarrassed and would like to forget that it ever happened. If I had to guess, I lost 60-90 seconds but who knows. Knowing that I had just lost some of my swim lead, I knew I needed to take some risks to make up that time lost. With 3 aid stations and a bunch of turns, I figured there would be plenty of opportunities to take some risks and make up some ground. I planned to ride conservatively for the first half of the race at 250 watts and then turn it up coming back at 260 watts. The weather was rather cool for the first 45-60 min. In the shade, it was cold, but once in the sun, it was comfortable. I was feeling good, my power was a little north of 250 watts, and my hr was down. Fortunately I was the 5th wave out so the course did not have much traffic at all. I focused on trying to reel each person I could see in front of me in the distance. I rode right through the first aid station without grabbing anything and losing any speed as I hoped others would slow down and I could find more time. To my surprise, around miles 25-28, someone went flying by me. I was pushing 250-260 watts and I had no idea how he was holding that kind of speed/power. I immediately noticed the bib number and “33” on his calf which meant he was in my AG. I didn’t want to let him go just yet so I decided to see what it would take to stay with him. I kept him insight and upped my power to 270-290. After a few minutes, I knew if I kept this up, it wouldn’t end well on the run. So went back to my race plan at 260 watts and just tried to keep him insight for as long as possible. He rode a way quickly after that and I never saw him again for the rest of the ride. Not knowing who he was at the time, I was hoping he would either blow up on back half of the ride or I would see him on the run. The last half of the bike presented some rolling hills and to my surprise, my legs felt strong the whole way. My legs usually start fading and my power drops around miles 40-45 but it never happened which tells me we are making improvements on the bike. 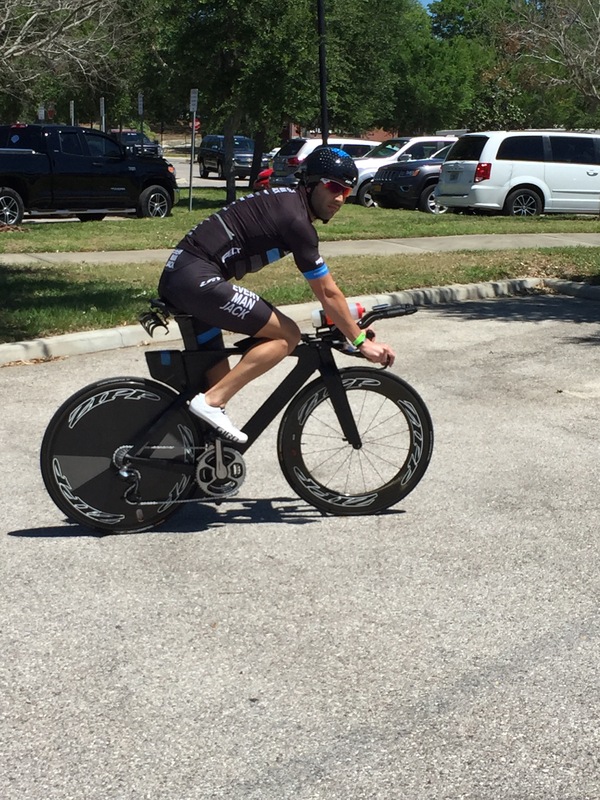 I focused on flattening out the course and keeping steady consistent power all the way into T2. I did change my nutrition a tad compared to previous 70.3’s. I started using GU Energy chews and gel’s which seemed to have kept my stomach under control. I came into T2 knowing I was near the front of the race and figured I only had a few guys in front of me and one of them was in my AG. I came into T2 and Dave Ragsdale (who is the best announcer of all time… seriously if you ever do a race where he announces, you’ll understand) told me I was 4th guy into transition and Dylan was about 3 minutes ahead. I had a quick transition and set out on the run. Eric warned me to keep the the first mile under control and not to be worried if the legs felt like crap. I knew my running was in good form so I had hoped to run 6:10-6:20 pace. I clocked off the first mile in 6:17 and it felt easy…. game on. I hit the first the major hill and passed a guy in one of the older AG’s who was in an earlier wave. The 3rd place biker (Jesse) was with him and once I made the pass, Jesse started following me, which was a nice surprise and a first for me. Near the end of the first loop at an out and back section, Dylan still had about 3 min on me as we crossed paths. I started the 2nd loop and got a huge rush of adrenaline as I ran by all the spectators. I kept my effort on the hills controlled; trying to keep the effort steady and not worry about my pace slowing. I struck up some conversation with Jesse as I was trying to distract my mind. He was a big help as he encouraged me up the hills and even yelled at me a few times not to slow down as I hit the crests of the hills. Loop 2 went by pretty fast and I was right on goal pace still. I shrunk the gap to Dylan to ~2:30 and noticed I had someone about 3 minutes behind me. I knew loop 3 would be tough. My pace started to slow and it was starting to get hot. I tried to get in as much water as I could while maneuvering the crowded aid stations. I will say that the volunteers were awesome on the run course. They were all full of encouragement and I was sure to thank them as I ran by. Dylan and I crossed paths one last time and the gap was 2 min. There wasn’t much more I could have done as I knew I was on pace for a great run. I had hoped to run 1:23 but after a quick glance at the watch, I knew 1:22 was possible if I finished strong. I picked up the pace the last mile and tried to leave it all out there. I crossed the finish line knowing I just had an awesome run and was thrilled. Overall, I’m extremely pleased with the race. Congrats to Dylan on the overall amateur and AG win!! He’s a tough competitor and it was awesome racing him. There were a bunch of positives to take away from the race and there were also some negatives that I need to work on. I’ve made a lot of improvement in my run just in the last year and I honestly didn’t think I would be able to run 1:22 off the bike a year ago. My biking has been a strength for a while but I feel I rode a bit complacent. I gave up way too much time to the other top bikers in the field, though some of that was contributed to my mishap. It’s something I’ll need to address in the coming months. The biggest take away is that I escaped in one piece and will walk down the aisle and marry my best friend in just 6 days without any major injury. I hope everyone enjoyed the facebook live coverage Mandy put on. She put on an awesome show for all of you. Hopefully it was a lot better watching it than following IRONMAN’s tracker that works 10% of the time, every time. Big thanks to Team Every Man Jack and all of our awesome sponsors…. Every Man Jack, Lululemon, Louis Garneau, Sock Guy, Normatec, Oakley, Roka, GU Energy, Garmin, Boco Gear, and Cobb Cycling. Hey Steve, great race report, you are a beast! 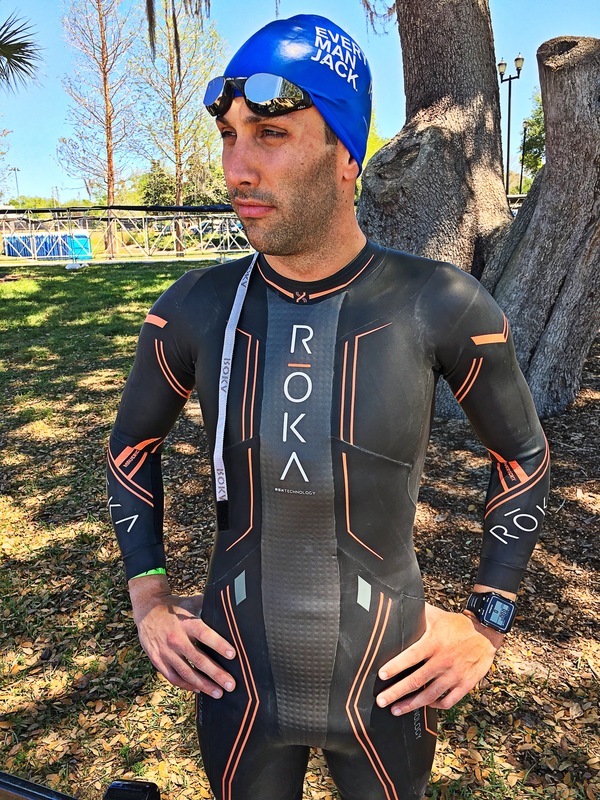 I’m racing 70.3 Florida this year and while I’m primarily a cyclist, I dabble in triathlon mostly so I don’t have to sit on the sidelines while my girlfriend races. My strategy for most triathlons is float-hammer-crawl, so I’m really looking to put down a solid time on the bike, what was your FTP and power/weight going into the race? What % FTP were you targeting? Thanks Dan! My FTP was ~305 and I weighed 158 lbs so 4.25 w/kg. I was targeting 85% of FTP (260 watts). Good luck this year at the race!